It will be the team no one wants to face, the scariest opponent because of their talent and skill but also because losing to a group of the best young players in the NHL won't sit well with the veterans who will make up most of the other rosters at the 2016 World Cup of Hockey. Team North America -- the top Canadian and American players who will be 23 years old or younger as of Oct. 1, 2016 -- will not be a pushover at the best-on-best tournament in Toronto next September. The roster, which will be put together by general managers Peter Chiarelli of the Edmonton Oilers and Stan Bowman of the Chicago Blackhawks, could feature four of the past five No. 1 draft picks, as many as four Calder Trophy winners, and a two-time Stanley Cup champion. "There is no way you want to lose to the young bucks," Canadian defenseman Drew Doughty (Los Angeles Kings) said. "The League is all about being a veteran and having experience, so there is no way we'd want to lose to them." Sean Couturier, Philadelphia Flyers, C -- Couturier seems like the perfect fit to be the fourth-line center and top penalty-killing forward, especially considering most of the forwards available are not regular penalty-killers. What he has lacked in offense in his four-season NHL career (118 points in 287 games) he has more than made up for in his defensive and possession game. He has been better than 50 percent in his shot-attempts differential per 60 minutes (SAT) the past three seasons, including 55 percent in 2013-14, according to war-on-ice.com. He has done this despite starting more than 60 percent of his shifts outside the offensive zone. Couturier, 23 on Dec. 7, helped Canada win the gold medal at the 2015 IIHF World Championship, where he had seven points and was plus-13 in 10 games. Jack Eichel, Buffalo Sabres, C/RW -- Eichel, selected No. 2 behind Connor McDavid in the 2015 NHL Draft, is expected to have a full year of NHL experience when the tournament comes around. He's a different type of center from McDavid in that he's considered to be more powerful and McDavid has enviable skill. Eichel, 19 on Oct. 28, is 6-foot-2, 196 pounds and has the power to go through a defense instead of going around it. He will be Team North America's most powerful center but might have to play right wing because of the depth at center and dearth of right wings. Connor McDavid, Edmonton Oilers, C -- McDavid, the No. 1 pick in 2015, also is expected to have a full NHL season behind him. He could (and some would argue should) show this season that he will be the No. 1 center for Team North America. Canadian forward Steven Stamkos, who has scored 60 goals in an NHL season and was the No. 1 pick in 2008, recently called McDavid the best 18-year-old player he's ever seen. His hype rivals that of Sidney Crosby when he entered the NHL with the Pittsburgh Penguins 10 years ago. Sean Monahan, Calgary Flames, C -- Monahan was a surprise success story as a rookie in 2013-14, when he had 22 goals and 34 points in 75 games. He made significant strides last season, when he helped the Flames reach the Stanley Cup Playoffs with 62 points (31 goals, 31 assists) centering the top line with Johnny Gaudreau and Jiri Hudler on his wings. Monahan, 21 on Oct. 12, was plus-8 last season after finishing minus-20 as a rookie. Ryan Nugent-Hopkins, Edmonton Oilers, C -- Nugent-Hopkins, the No. 1 pick in 2011, could be the most experienced player on Team North America. He turns 23 on April 12 and is entering his fifth NHL season. He has had back-to-back seasons of 56 points, including an NHL career-high 24 goals last season. Nugent-Hopkins has missed eight games in the past two seasons after battling injuries in his first two. He was 175 pounds when he entered the NHL four years ago but has his playing weight up to 190. He said that has made him a more effective player, particularly when he has to go into the corners to battle for the puck. Mark Scheifele, Winnipeg Jets, C/RW -- Scheifele has climbed the Jets' depth chart to be their No. 2 center entering this season behind Bryan Little. Scheifele, 23 on March 15, had 49 points (15 goals, 34 assists) in 82 games last season after getting 34 points (13, 21) in 63 games as a rookie. He has represented Hockey Canada five times, including twice in the IIHF World Junior Championship; he had 14 points in 12 World Junior games and helped Canada win gold in 2012. Like Eichel, he might be pushed to the wing. Jonathan Drouin, Tampa Bay Lightning, LW -- Drouin's rookie season with the Lightning was a learning experience. He had 32 points, including 28 assists, in 70 games, playing mostly in a bottom-six role and was a healthy scratch for 20 of 26 games in the Stanley Cup Playoffs. Lightning general manager Steve Yzerman said shortly after the season ended he expects Drouin to compete for a larger role this season. His skill has never been in question, and Yzerman said the adversity from last season will help him. Drouin, 21 on March 28, is penciled in as the 13th forward on this roster but could fly up the depth chart with a strong second NHL season. Alex Galchenyuk, Montreal Canadiens, LW -- Galchenyuk, 22 on Feb. 12, is coming off the best of his three NHL seasons. He scored 46 points, including 20 goals, in 80 games last season after he had 13 goals and 31 points in 65 games in 2013-14, and 27 points in 48 games as a rookie in 2012-13. The No. 3 pick in the 2012 NHL Draft has been playing out of position on the wing, but Canadiens general manager Marc Bergevin said Galchenyuk will play center this season. He could warrant a position switch on this roster a year from now. Johnny Gaudreau, Calgary Flames, LW -- Gaudreau, who turned 22 Aug. 13, was a finalist for the Calder Trophy last season, when he scored 64 points in 80 games playing on a line with Monahan and Hudler. He had 24 goals and 40 assists, showing an array of stick skills and slick skating, which more than makes up for his size (5-9, 150), which he said is actually an advantage for him because as a smaller, quicker player he can dart in and out of areas to get the puck before getting hit. Jonathan Huberdeau, Florida Panthers, LW -- Huberdeau, 23 next June 4, was the Calder Trophy winner in 2012-13, when he had 31 points in 48 games during the lockout-shortened season. He had his best full NHL season last season, with 39 assists and 54 points in 79 games. Huberdeau will add a playmaking flair and could find his way into the top six, though competition on the left side is difficult. Brandon Saad, Columbus Blue Jackets, LW -- Saad is the only player on this roster who has won the Stanley Cup, twice with the Chicago Blackhawks. He made his biggest impact last season, when he scored eight goals in 23 playoff games. He turns 23 on Oct. 27 and has played in 67 playoff games. With 52 goals and 126 points in 208 regular-season games, he was traded to the Blue Jackets on June 30 and signed a six-year contract with Columbus on July 3. Nathan MacKinnon, Colorado Avalanche, RW -- MacKinnon, who will turn 21 shortly before the tournament begins (Sept. 1), is coming off a disappointing second season after winning the Calder Trophy in 2013-14. He scored 63 points, including 24 goals, in 82 games as a rookie to help the Avalanche win the Central Division with 112 points; he had 38 points in 64 games last season, and the Avalanche didn't make the playoffs with 90 points. MacKinnon scored nine points in 10 games at the World Championship, helping Canada win gold. Ryan Strome, New York Islanders, RW -- Strome, who turned 22 on July 11, developed into one of the Islanders' top forwards last season, scoring 50 points, including 17 goals, in 81 games. He had 18 points in 37 games as a rookie in 2013-14. Strome can play center or wing, but it's more likely he'd be on the wing in this tournament. Matt Dumba, Minnesota Wild -- Chiarelli mentioned how fast he expects this team to be, especially on defense. Dumba, who turned 21 on July 25, fits the bill, compensating for his size (6-foot, 189) with his legs. In his first 32 games last season, Dumba had two goals, six points and 38 shots on goal in 12:24 of average ice time. In his final 26 games, he had six goals, 10 points and 48 shots on goal in 18:14 of average ice time. Aaron Ekblad, Florida Panthers -- Ekblad won the Calder Trophy last season after averaging 21:48 of ice time playing on the top pairing and the first power-play unit with Brian Campbell. 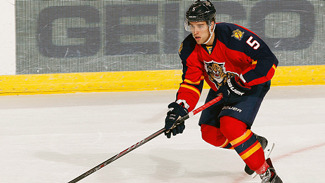 Ekblad, 20 on Feb. 7, had 12 goals and 39 points in 81 games to finish eighth in rookie scoring. His smooth transition from junior to the NHL after being the No. 1 pick in the 2014 NHL Draft suggests Ekblad could be just as comfortable adjusting to the heightened level of play in the World Cup. Dougie Hamilton, Calgary Flames -- Hamilton, who turned 22 on June 17, became one of the Boston Bruins' most important defensemen, only to be traded to Calgary as a restricted free agent at the 2015 draft. Hamilton raised his play when the Bruins lost Zdeno Chara for 19 games, scoring four goals and 15 points to help Boston go 11-7-1. Playing primarily as Chara's partner, Hamilton had the best possession numbers among Boston defensemen last season and scored 10 goals and 42 points in 72 games. Seth Jones, Nashville Predators -- A big, mobile defenseman (6-foot-4, 205) with excellent offensive instincts, Jones was third among Predators defensemen with 19:52 of ice time per game. Jones, who turns 21 on Oct. 3, played with a variety of partners and maintained his steady play, scoring eight goals and 27 points in 82 games and seeing significant time on the penalty kill (1:40 per game) and power play (2:11). Ryan Murray, Columbus Blue Jackets -- In 78 NHL games, Murray has scored five goals and 24 points, and averaged 19:43 of ice time, playing on the power play (1:52) and penalty kill (1:44). The problem is those numbers have come in two seasons because a series of injuries derailed the start of his career. If the No. 2 pick in the 2012 NHL Draft can stay healthy, he will be an important part of the Blue Jackets defense, and his strength in his end would make him just as valuable for Team North America. He turns 22 on Sept. 27. Morgan Rielly, Toronto Maple Leafs -- Rielly, 22 on March 9, was one of the lone bright spots in what was an otherwise forgettable season for the Maple Leafs, establishing himself as a cornerstone of their rebuild. An excellent skater with a powerful shot, Rielly scored eight goals and 29 points in 81 games, and his usage increased drastically after Randy Carlyle was replaced by Peter Horachek as coach Jan. 6, topping 20 minutes of ice time in 36 of his final 42 games. Jacob Trouba, Winnipeg Jets -- Trouba, 22 on Feb. 26, led Jets defensemen and was fourth among NHL defensemen in penalty-kill time last season at 3:21 per game. He played difficult minutes, starting the majority of his shifts in the defensive zone yet leading Jets defensemen in score adjusted SAT percentage, according to war-on-ice.com. Trouba scored seven goals and 22 points in 65 games, playing almost two minutes per game on the power play. John Gibson, Anaheim Ducks -- Gibson is by far the most accomplished of the goalies eligible for Team North America and has to be considered the favorite to win the starting job. He has made 24 NHL starts; every other eligible goalie has combined for four NHL starts. With Frederik Andersen and Anton Khudobin also with Anaheim, it's possible Gibson, who turned 22 on July 14, begins this season in the American Hockey League. Connor Hellebuyck, Winnipeg Jets -- Hellebuyck has never appeared in an NHL game and has played one season in the AHL, but his performance for the United States at the 2015 World Championship put him in a good position to earn a spot on this team. Hellebuyck was the best goaltender in the tournament, with a 1.37 goals-against average and .948 save percentage to help the U.S. team win a surprise bronze medal. Malcolm Subban, Boston Bruins -- Subban made his NHL debut last season, but it did not go very well; he allowed three goals on six shots in 31 minutes of a 5-1 loss to the St. Louis Blues. Subban, 22 on Dec. 21, has two excellent seasons in the AHL, with a .920 save percentage as a rookie two seasons ago and .921 last season.